The overall health, both of New Jersey’s economy and its people, is clearly tied to the capabilities of the evolving healthcare industry. New Jersey’s healthcare industry continues to develop and transform itself to meet the needs of New Jersey’s growing population, changing demographics and the Baby Boom generation which is putting additional stress on the system as it reaches its full maturity. The NJDOL got it exactly right. And it’s not just New Jersey whose economy is closely tied to the expanding healthcare industry – much of the northeast region is enjoying the growth of the three primary components of the sector: ambulatory health care services (facilities providing outpatient services; doctors’ offices for example) nursing and residential care facilities, and hospitals. In addition, behavioral health centers continue to evolve treatment techniques and expand their networks to become more accessible to patients. In the past few years, we’ve seen tremendous changes and consolidation in all areas of the region from hospital mergers to facilities catering to older residents who are living longer and active lives. We have detailed in this space about the important strategic changes PS&S has made to ensure we are well-positioned to assist with the continued growth in the healthcare industry. In 2015, our Cherry Hill office welcomed architects Charles Clauser, Harry Wright and Steve Sgro to create a formidable team in southern New Jersey providing architectural and interior design, project planning and graphics and rendering services with a concentration in the healthcare sector. This newsletter will focus on our expanding healthcare practice with analysis from Chuck Clauser, our Senior Director with more than 30 years of architectural experience. Also in 2015, Christopher Gulics and his team joined PS&S bringing more than 20 years of experience providing environmental regulatory compliance services to many healthcare clients. These services focus on operational permit compliance relative to air pollution, drinking water, wastewater, waste management, and spill prevention services. Currently, there is a focus on the presence of lead in drinking water, and PS&S is providing compliance and engineering services to two large healthcare systems to address lead concerns identified in their water distribution systems. In New Jersey, a bill (A4139/S2497) is pending and could require health care facilities to perform periodic testing for lead in their drinking water regardless of the water source. This bill can have a significant impact on a number of health care facilities to comply with the initial testing requirements and more so, addressing the potential impacts the testing may identify. Also in this newsletter, we will also check in with our Young Professionals Group as the members continue PS&S’s tradition of community service. We are delighted that 55 years after its founding, the core values of our company are still front and center. For more information, please contact Anthony Sartor at asartor@psands.com, or John Sartor at jsartor@psands.com. 18 percent of New Jersey’s economy is rooted in healthcare. In fact, New Jersey Policy Perspective argues the healthcare sector “kept the state afloat” during the economic recession. New Jersey’s healthcare landscape is much different now than it was even ten years ago. Through consolidation and recession, pharma isn’t as “big” as it once was, leaving behind huge properties and campuses that are being redeveloped and reimagined. Ambulatory health care services (facilities providing outpatient services; doctors’ offices for example), residential care facilities and hospitals round out the healthcare sector which is clearly not a “one size fits all” industry and demands expertise in building for the future. 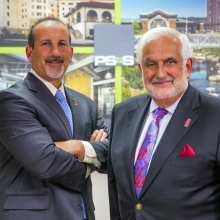 With its dedicated healthcare and architectural practice, PS&S is in a unique position to guide and support this healthcare renaissance by bringing its healthcare capabilities to the entire industry. Together, the PS&S healthcare team has more than 90 years’ experience in the sector. We have seen development and know what works and what doesn’t. We recognize that most healthcare systems have to do more with less revenue. Costs are rising and needs are growing and changing while revenue is shrinking. How do companies make this equation work for them? The face of healthcare is changing - it’s a consumer’s market and providers have to adapt. Hospital systems are reaching out to their patient base by bringing services to the community. With certain exceptions such as emergency care, services are moving into the community to be closer to residents. This includes moving urgent care, imaging, senior care, and wellness programs to strip malls and locations in town centers. PS&S competes with larger firms because of our single source of structural, civil, geotechnical and environmental capabilities. By sharing disciplines and expertise across the company, we have the full-service of offerings and synergy between all our groups. It is a business model that works for our company and our clients due mostly to the PS&S employees who are experts, have foresight and have an ability to adapt quickly to changing market, consumer and regulatory forces. For more information, contact Charles Clauser at cclauser@psands.com. PS&S proudly co-sponsored this year’s National Engineers Week event at the Liberty Science Center in Jersey City to raise awareness about engineering. The North Jersey Branch of ASCE hosted the two day event to celebrate engineers and showcase the marvels of engineering. Thousands of children and parents participated in educational programs and activities with the assistance of nearly 200 volunteers. Children were guided through a series of activities to help them learn about different problems that engineers work to solve every day. Interactive exhibits and hands-on activities were aimed at helping the budding engineers apply creative thinking to all sorts of exciting engineering topics. Several members of PS&S’s Young Professionals Group helped with the volunteering efforts including Brian Liebeskind, Rita Exposito, Christopher Zuidema and Leonardo Afanador. Christopher’s topic was the Seismic Shake-Up. The purpose of this topic was to inform the children about the destruction of earthquakes, the general consequence it has on millions of people that live around the rim of the Pacific Ocean (“RING OF FIRE”), and the role earthquake engineers have in society. The activity allowed children to brainstorm, design, and build their own 8-inch stable structure capable of enduring an earthquake event.